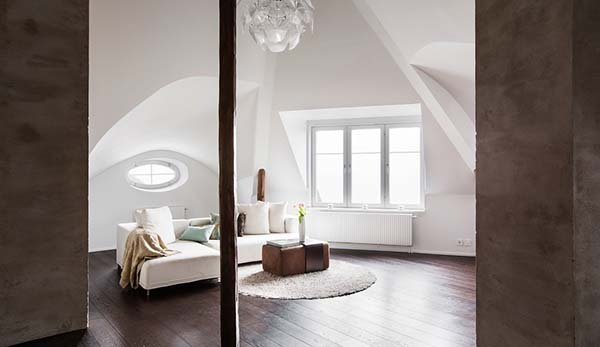 We have shown you different designs of lofts before and we are all impressed by how these were done especially in terms of function and aesthetics. The design would of course depend on the needs and lifestyle of the owners. For us who doesn’t live in the space, we take their spaces as a source of inspiration where we can get ideas of what we can do with our own spaces. 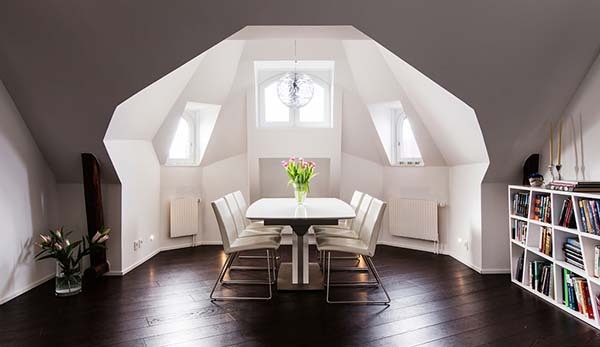 Today, we will feature a bright and spacious four-room loft with attached terrace. 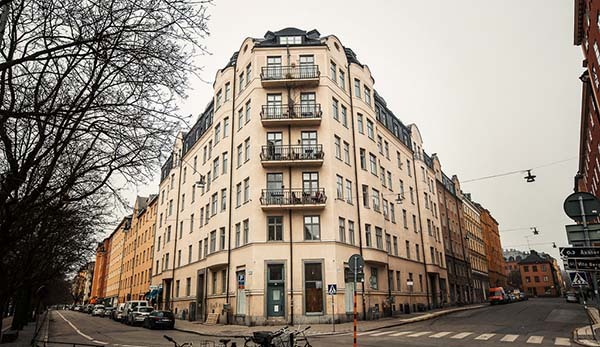 The space offers an expansive view of its location in Södermalm, a district in Stockholm, Sweden. 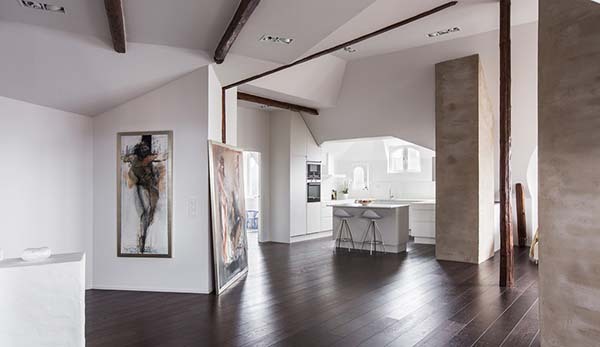 The loft is comprised of 1,862 square feet (173 square meters) of living space which was remodeled with high-end finishes and materials. When the entering the space, one is welcomed with a social area with living room, dining room and a fully equipped open-plan kitchen. 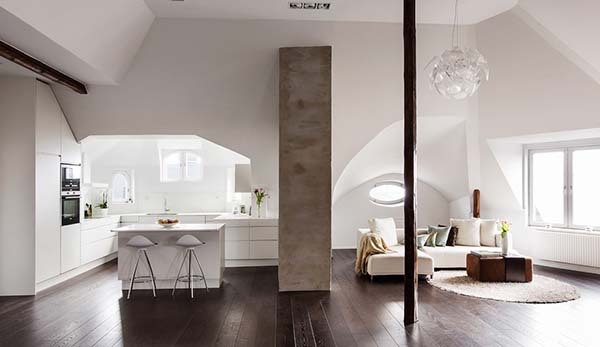 It used “dark wooden flooring and exposed beams harmonize the white washed walls, plastered surfaces and otherwise austere surfaces”. 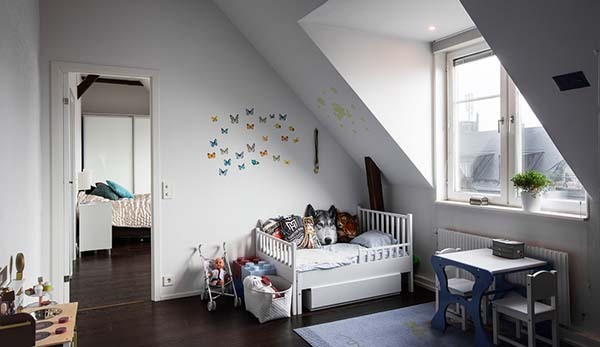 It also features a cozy roof terrace, a laundry room, three bedrooms and two bathrooms. 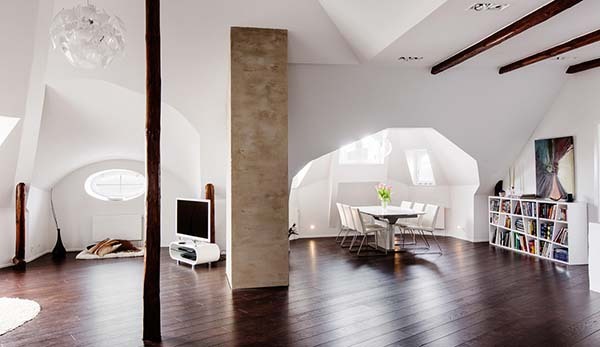 The interior of the loft used white colors for the walls with a unique ceiling design. Take note of the ceilings near the windows, it does have an unusual design. Aside from the unique ceiling design, columns can also be seen in the interior. The dining area is like inside a white cave with windows around it. The living area is simple and is flooded with natural light. 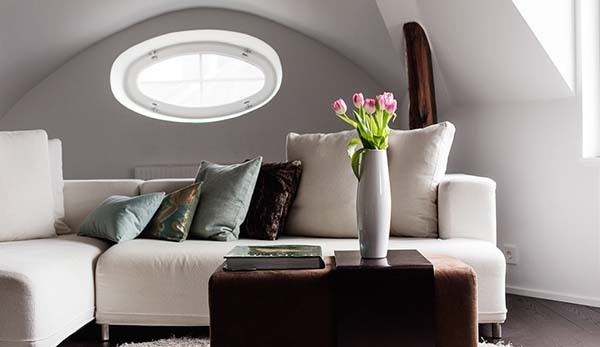 An upholstered coffee table is used for the living area. 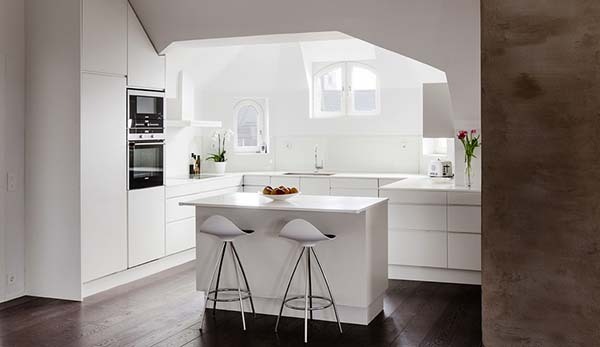 This is the kitchen in all white colors and neat looking cabinets. It also have arched windows around it too. 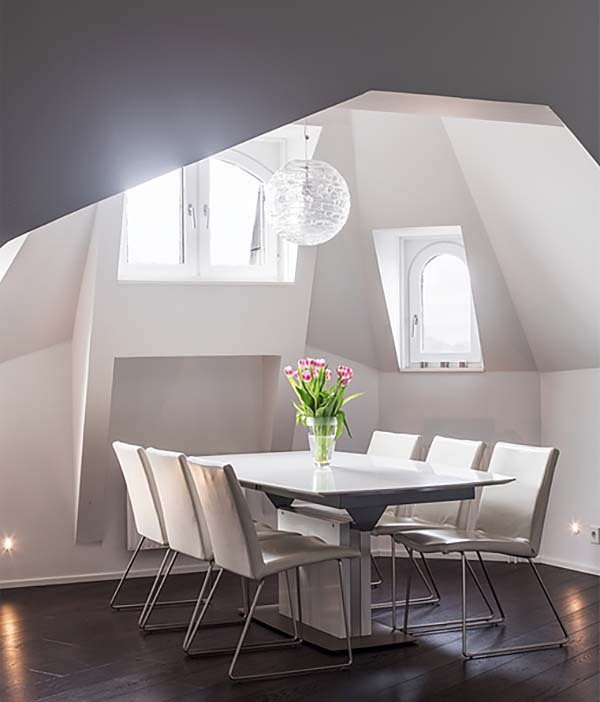 The dining space is graced with a dining set that is white and glossy. This is the bedroom that may be small but is complete with a wardrobe. 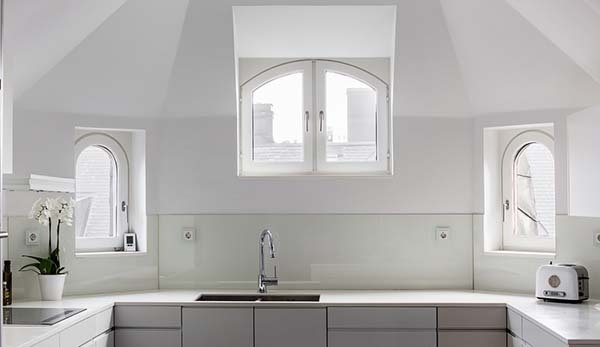 It is also surrounded by windows too allowing a good view of the location. 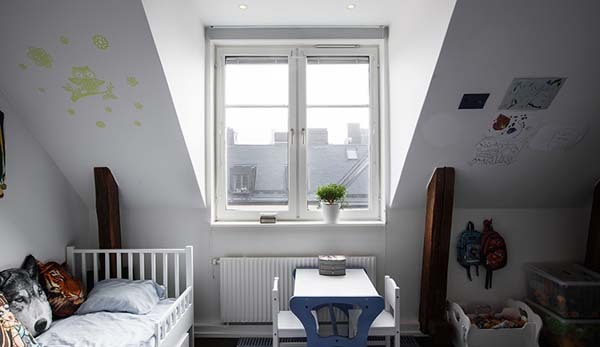 This one is the toddler’s bedroom that looks Scandinavian yet playful. And it still has the same windows with what the masters bedroom has. The social area is spacious that may appear like a gallery with these paintings. Different artistic items are seen in the interior. Take note of the design of the bookshelves too. 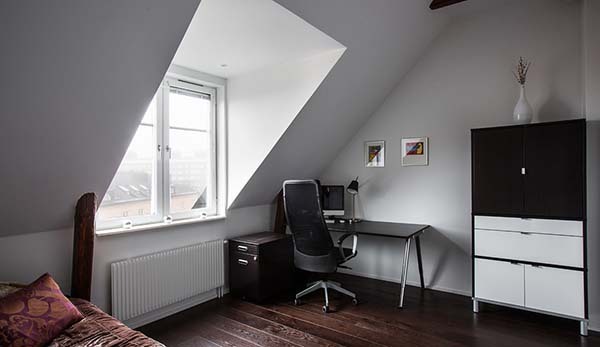 And this one is a working area in the bedroom. 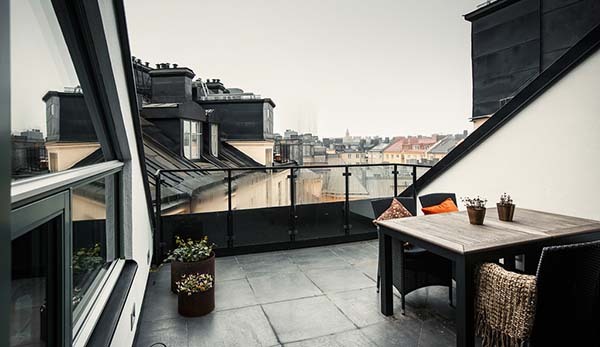 A roof terrace has an industrial look that overlooks the city. 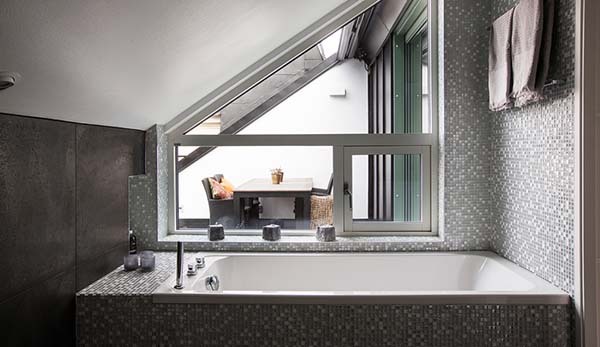 Meanwhile, the bathroom has mosaic tiles around it from the walls to the bath tub. This is the view from the terrace of the loft. And this is the building where the loft is contained. 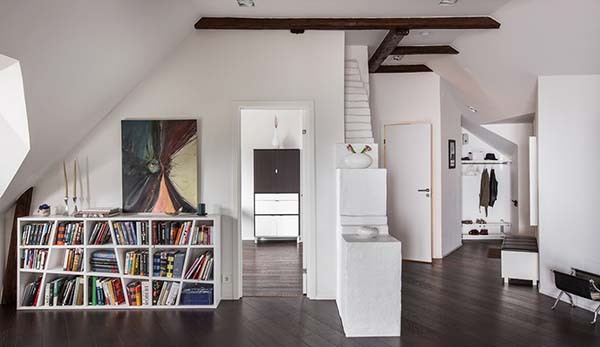 This stunning loft is found in Wrede with warm and spacious interiors. 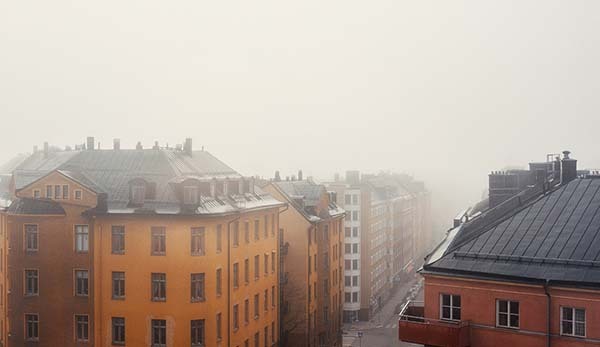 It has many windows and wonderful lighting that creates a soothing atmosphere for the enduring Swedish winters. 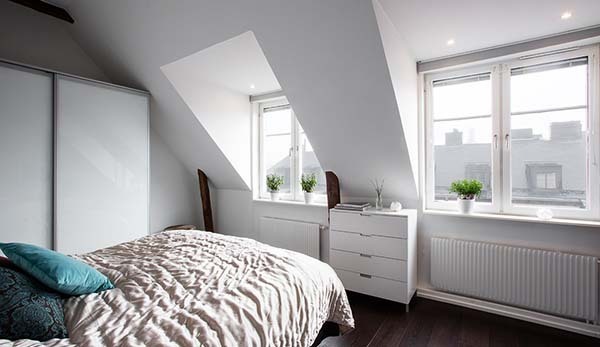 There is also plenty of storage in the loft with certain functions that fits the needs of the owners. 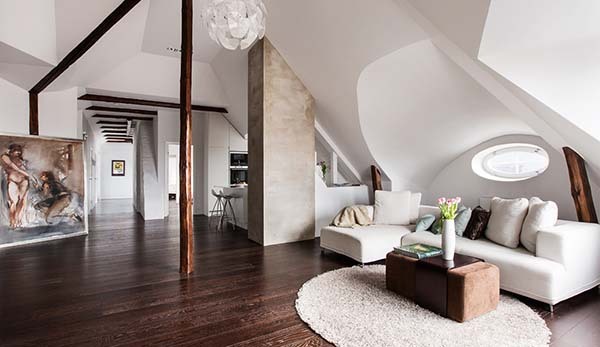 What can you say about this loft?